Miss Lucy Bailey, beloved Principal of VICTORY HIGH SCHOOL who died on March 30, 1950, will never be forgotten by the alumni, students and faculty of the Adamston Institution. The VICTORY HIGH SCHOOL Alumni Association, which was organized almost immediately after her death, started a $6,000 scholarship fund in honor of her memory. The award will be given each year to a student from the senior class of VICTORY on a majority vote by the members of the faculty. 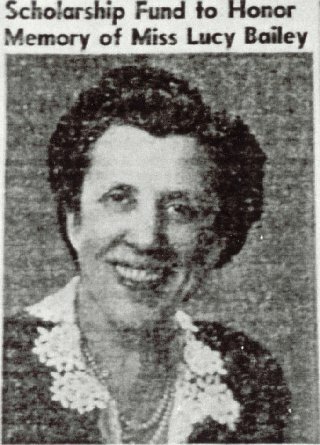 Miss Bailey became principal of VICTORY in 1937 after teaching English there since 1924. The scholarships are still active today and are now given to students of Liberty High School because it replaced VICTORY HIGH SCHOOL.